The 7.62 mm. NATO caliber Fabrique Nationale de Herstal - Fusil Automatique Leger (Light Automatic Rifle), or FN-FAL was produced by FN beginning in 1953. Designed by Dieudonné Saive, the legendary Belgian small arms designer who was the successor to John Browning as FN's chief firearms designer following Browning's death in 1926 (if you ever wondered how FN became the world's most successful firearms manufacturer, it's as simple as Browning and Saive). Prior to designing the FAL, Saive designed what many view as the last elegant old world military rifle, the rifle which bears his name, the Saive Automatique Fabrique Nationale (SAFN) Modèle 1949 self-loading rifle. The FAL was an attempt to marry the old world craftsmanship of the SAFN 1949, with the groundbreaking German Sturmgewehr (assault rifle) concept introduced during the Second World War. Saive succeeded brilliantly, creating the assault rifle by which all others were measured for decades. The FAL was capable of tremendous accuracy out to very long ranges. The FAL has been used by more than 50 countries and remains in use today, some 50 years after it's introduction. The FAL saw widespread combat service in no less than 14 wars. It became known by FN's clever Cold War advertising slogan as "the free world's right arm." Many countries manufactured the FAL under license and produced bayonets. This page provides a type-specific approach for identifying FAL bayonets, as an alternative to the country-specific index. This page is by no means exhaustive, but covers some of the more common types encountered today. Most FAL bayonets conform to three basic types: the Type A, Type B, and Type C, designed by FN in Belgium; and the L1 Series designed in Britain. FN's initial bayonet design was what we know today as the FAL Type A bayonet. It was an innovative design that confronted the adverse effects that a bayonet has on the accuracy of a self-loading rifle with new technology. It's designers introduced the "free-recoil" concept, where a spring plunger hidden inside the hilt allowed the bayonet to float during rapid semi-auto and full-automatic fire, decreasing the bayonet's adverse effect on accuracy. This ingenious approach was later adopted by the Dutch firm, Artillerie Inrichtingen, when designing a bayonet for another groundbreaking assault rifle, the Armalite AR–10. 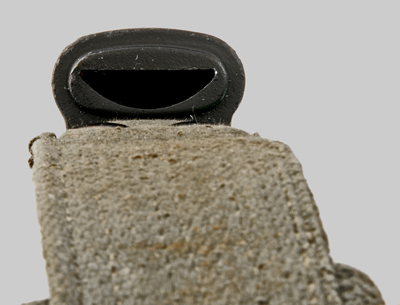 The most distinctive feature of the Type A bayonet are the flash-hider "prongs" integral with the muzzle-ring. These served as an ersatz flash-hider on early FALs that had no muzzle device. The blade profile is a variation of the U.S. M4 design. The grip scales can be wood, plastic, or sheet steel. The steel scabbard follows the standard FN Mauser export bayonet scabbard design developed in the 1920s. Scabbards with oval frog studs are also encountered. The Type A was the FAL bayonet used with the early FAL rifle, which had no muzzle device. The early Type A bayonets had a flat spring catch, as seen on the Belgian example below. Most Type A bayonets had a curved spring catch, as shown on the Argentine and South African examples below. When NATO standardized on the 22 mm. rifle grenade, FN began producing rifles with a 22 mm. combo-device in 1962. This necessitated a new bayonet design, due to the large diameter muzzle device required to accept and launch the 22 mm. rifle grenade. Despite it's obsolescence, the early FAL rifles and Type A bayonet remained in use for many years, seeing combat service with Argentine forces during the 1982 Falklands War. The Type B bayonet was for use with FAL rifles equipped with the long Belgian "Browning-style" flash hider. The Type B differed from the Type A in having a shorter blade, larger muzzle ring, and lacking the Type A bayonet's flash hider prongs. The long flash hider was not popular, only being adopted in small numbers by Chile, Cuba, South Africa, and the German Bundesgrenzschutz (Federal Border Guard). The T-48 FAL rifles used in the 1950s U.S. Army Trials that resulted in adoption of the M14 selective fire rifle were also equipped with the Type B bayonet. Not having been produced in large numbers, the Type B bayonet is uncommon today. The Type B bayonet was for FAL rifles equipped with the long Belgian "Browning-style" flash hider. The Type B bayonet differs from the Type A in having a shorter blade, larger muzzle ring, and lacking the flash hider prongs. The long flash hider had a tendency to burst (i.e., banana peel). It was not popular, only being adopted in small numbers by Chile, Cuba, South Africa, and the West German Bundesgrenzschutz (Federal Border Guard). The T-48 FAL rifles used in the 1950s U.S. Army Trials that resulted in adoption of the M14 selective fire rifle were also equipped with the long flash hider and Type B bayonet. Not having been produced in large numbers, the Type B bayonet is uncommon today. I obtained this example directly from South Africa. As a Cold War tactic for facing down the much larger Soviet Army, NATO standardized on a 22 mm. diameter rifle grenade to simplify logistics when troops from different countries operated together. For the FAL, this meant either carrying an attachable NATO-spec grenade launcher or incorporating a larger diameter flash-hider/grenade launcher (combo device) into the FAL design. Many non-NATO countries chose to conform to NATO standards as well, resulting in the majority of FALs produced after 1962 having the 22 mm. combo-device. The Type A bayonet would not work with the larger flash-hider. Although innovative, it was also a costly and complex design. For its replacement, FN took a back-to-basics approach, returning to the most lasting of bayonet designs—the socket bayonet. The Type C socket bayonet fits over the combo device, so the socket was made with a set of slots that lined up with the combo device's flash-hider slots. The socket was long, almost as long as the blade. A simple spring catch was placed at the rear of the socket. The bayonet was much lighter than the Type A, mitigating the need for a free-recoil mechanism. The blade had a semicircular profile, being flat on top and rounded below. Although far from elegant (it resembled a kitchen apple-corer), the Type C was an effective bayonet design that was easy to manufacture. Early Type C bayonets had serrations on the spring catch. Later examples used a modified spring catch with "wings" instead of serrations. Both catch designs were produced concurrently, so describing one as early and the other as later is somewhat of a misnomer. The serrated catch is the M1963 and the winged catch is the M1965. The final FN production Type C bayonets were cast, rather than drawn. Most are devoid of markings. The most common finish is black paint. Parkerized examples are also encountered, as are examples with paint over parkerizing. Many scabbard variations exist. The scabbard body may be steel or plastic. Some scabbards have frog studs, while others have an integral web or steel belt hanger. Some scabbards have the mouthpiece aligned so the socket faces outward when worn, while others are aligned so the socket faces inward. The Type C presents somewhat of an enigma. It was the most popular FAL bayonet, used by dozens of countries. There are many variations, however, relatively little is known about which countries used what variants. The examples below and on the following page illustrate 11 Type C bayonet variations that currently reside in my collection. This bayonet has the M1965 spring catch and is unmarked. This example is parkerized, with black paint over the parkerizing on the socket only (a very common finishing for these). This scabbard is an uncommon Fabrique Nationale (FN) steel-bodied scabbard. Note that the throatpiece is oriented so that the socket faces outward when carried. This is typical of most FAL Type C scabbards. This bayonet and scabbard combination was reportedly used by the Netherlands.